With matrix capable calculator, simplex algorithm for common maximization problem can be solved easily like in the TI-84. The Casio 9860GII is also equipped with equivalent matrix operations to solve the same problem. This entry was posted in Casio, Casio fx-9860GII, fx-9860, fx-9860GII, fx9860GII, Optimization, production planning, simplex algorithm and tagged Casio, graphing, inequality graph, linear programming, matrix, optimization, production planning, row+, simplex algorithm on January 31, 2016 by gmgolem. The classic 8-queens problem. TI Nspire performed best at 234MHz. This entry was posted in calculator, fx-9860GII, TI Nspire CX CAS and tagged calculator performance, Casio, n-queens, TI nspire on May 9, 2015 by gmgolem. 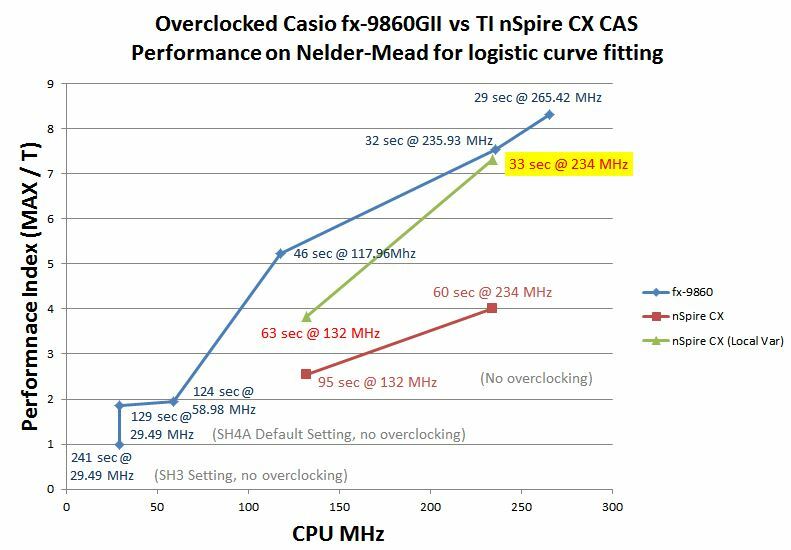 In previous rounds, Casio fx-9860GII with overclocking software Ftune2 won both rounds in a Nelder-Mead logistic curve fitting speed test, although TI Nspire CAS CX with Nover closed the gap on the second round after a little optimization on the language by declaring most variables local in scope. 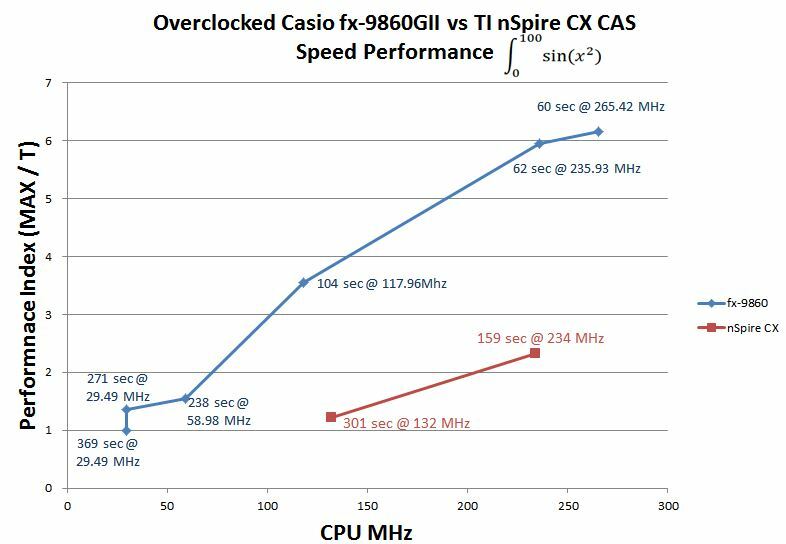 Again, Casio with Ftune2 outperform the TI Nspire. This entry was posted in calculator, Casio, fx-9860GII, TI Nspire CX CAS and tagged calculator performance, Casio, Ftune, Nover, TI nspire on May 1, 2015 by gmgolem. 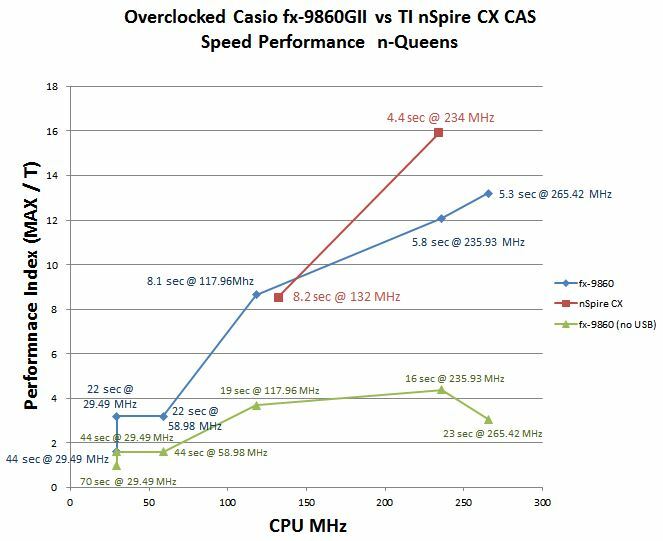 In a previous installment, fx-9860GII beats Nspire CX CAS in an overclocking match, computing the parameters for a logistic regression function by the Nelder-Mead algorithm programmed in their respective on-calculator environment. It is quite astonishing not only to see Nspire losing in the speed race, but also by how much it loses. To give the CX a second chance, while still maintaining the overall fairness, the program on the Nspire is enhanced by localizing variables (33 of them) and nothing else. The declaration of scope for variables is believed to be a common technique for performance boost. The logic of the program remain unchanged, so is the tolerance parameter. And the results – Nspire is catching up by doubled performance from 63 seconds to 33 seconds! This entry was posted in calculator, Casio, fx-9860GII, TI nspire, TI Nspire CX CAS and tagged calculator, calculator performance, Ftune, logistic regression, Nelder-Mead, Nover, optimization, overclock, TI nspire on April 22, 2015 by gmgolem. In last installment, the Casio overclocking utility Ftune2 improved the speed performance of a Nelder-Mead program by 4.5 times. For standard calculations, more impressive results are obtained from this nice utility. In this test, the standard normal distribution function is applied in the Casio fx9860GII Equation Solver and the task is to find the Z variable (as “T” in the below screen), given the cumulative probability distribution of 0.9 (as “A” in the below screen). The performance gain by overclocking is 7.6 to 8 times, depending whether the back-lit is on for non-overclocked runs. For the same equation solving by the TI Nspire using nsolve(), it took 01:30 to return a result of 1.28155156555.
both units return results instantaneously (Nspire returns 1.28155193868 while Casio returns 1.281551566). This entry was posted in Casio, fx-9860, fx-9860GII, fx9860GII and tagged calculator, calculator performance, Casio, overclock on April 12, 2015 by gmgolem.